﻿ Using Stones for Personal Growth. Rose Quartz: Intimacy. Like all quartz, Rose Quartz is composed of silicon dioxide. But unlike most quartz, it has a microcrystalline structure that usually prevents the formation of large single crystals with flat faces. Named after its color, it can take on a variety of gentle translucent pinks, from pale to strong pink. The rose color, the microcrystalline structure, and the often seen crackled texture all come from trace amounts of titanium in the crystal. Brazil is the largest supplier of rose quartz, but the best quality comes from the Malagasy Republic. Rose quartz has been valued since the time of ancient Egypt. It was honored by the Tibetans, and used by the Chinese as ornamental carving stones. The Romans, as well as the Egyptians, believed that rose quartz would prevent wrinkles and help create a beautiful complexion. 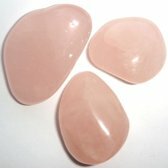 Rose Quartz acts on the Inner Being to strengthen Intimacy. Intimacy is the non-physical part of the connection that exists when you are close to someone. As defined here, it is a closeness of soul rather than a physical closeness, although the two can exist together. It is sharing a part of your Inner Being with someone in a way that creates a bond between you. If you have a strong capacity for intimacy, you find it easy to become close and form a bond with someone when the circumstances are right. If you are intimate with someone, the bond you have makes you feel in tune and connected with that person, and emotionally at home with him or her. You find it easy to exist comfortably within each other's space, and you almost can't help feeling some part of each other's emotions. Intimacy has both a doing side and a knowing side. The doing side is having the ability to be truly close to another person, to feel what he or she feels because of the bond that exists between you. The knowing side is recognizing who is good for you to be intimate with, since you don't have this kind of compatibility with everyone. The doing and knowing side of intimacy work together as a duality. This means that as you develop the ability to know who is good for you to be intimate with, you also increase your capacity for intimacy in general. If you have trouble with intimacy, you have difficulty knowing who you are compatible with. You tend to become involved in relationships that are bad for you because you are never quite sure who is good for you to be with, and who you should walk away from. The ability to be intimate with someone is closely connected with being compatible with that person in several areas. One of these areas comes from a mutual desire to be helpful to each other in a personal way. To practice this, tune in to someone you care about and put some energy into becoming more aware of what he genuinely needs in life. Learn to be sympathetic to his real needs, and offer to help him when you can. And to be sure the feeling is mutual, be strong enough to ask for his help when you need it. The compatibility you feel when you develop a mutual desire to help each other whenever help is needed, will greatly strengthen the level of intimacy between you. Another area of compatibility comes from a mutual desire to become involved only in relationships that are practical, useful and good for both of you. To practice this, work at being discerning, levelheaded and pragmatic about relationships. The wisdom you gain from this will help you develop an awareness of who you can have a good relationship with, and will help you walk away from relationships you know will be bad for you. If you understand this area of compatibility, and get involved only in relationships that are good for both of you, you will not only understand intimacy better, but you will also be able to become more intimate with those you get involved with. A third area of compatibility comes from a mutual desire to operate in a way that is tranquil and calming for both of you. To practice this, become more aware of what things are calming and reassuring to you, and to the people that are close to you. If the same types of things create a calmness in both of you, it contributes to your overall level of serenity, and creates a compatibility which enhances the intimacy between you. Another area of compatibility comes from a mutual desire to see things from the same reality perspective, that is, to find the same types of things credible and believable. To practice this, become more aware of what things you find believable and real, and become aware of the people around you who find those same kinds of things to be credible and believable. Having a similar outlook on reality allows you to be optimistic about the same kinds of things in life, and creates a compatibility in this area which enhances your closeness or intimacy with the other person.